A lifeboat crew has had a close encounter with a humpback whale off the Caithness coast. Thurso RNLI's coxwain Wing Munro spotted the animal and the boat was stopped allowing the crew to watch the large whale surface and blow water. Crew members Alan Munro photographed the whale while Kevin Davidson alerted his partner Karen Munro, a Sea Watch Foundation volunteer. She was able to see the humpback from the living room window of her home. The lifeboat crew first saw the whale while they were out to the west of Thurso Bay in a routine exercise on Sunday morning. 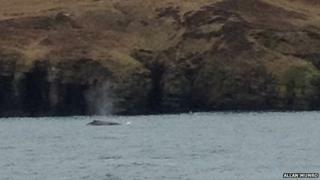 After seeing the whale from her window, Ms Munro headed to Ushat Head near Brims Ness where she saw two humpbacks. Colin Bird, Sea Watch Foundation co-ordinator for north east Scotland, has previously seen humpbacks off the east coast of Caithness. There have also been numerous sightings down the east coast this winter, where it was believed some have been wintering before heading to northern waters to feed over the summer. Ms Munro said: "Ten days previous I had a phone call to say that two large whales were blowing in Sinclairs Bay just to the north of Wick, were these the same animals? "We will never know for sure but it is possible." Humpbacks are found in the North Atlantic, North Pacific and Indian Ocean. Male humpbacks sing the longest, most complex songs in the animal kingdom, according the Whale and Dolphin Conservation Society.